Hand-Painted Silk Scarves, Jackets, & Capes~Expressions of Your Soul's Beauty. Unique, colorful Wearable Art and Paintings for Bold Women on a Mission. "Carol, Your work embodies the Divine Feminine. With the flowing grace of the silks and the abundance of the colorful rainbow, you share with women how to flow with their power in a graceful manner. 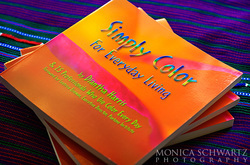 Diantha Harris & 25 professionals write about ALL aspects of color from home to business to gardens, spirituality, and more! A comprehensive and beautiful book! A LOVELY GIFT! Enjoy my article, "What are Your Unique Essential Colors?" Get your copy now. Great for GIFTS! Only $35 +$3.50 shipping in the U.S. Awakening your Soul's Beauty~~An Audio of a Transformational Visualization to expand your expression of who you are & attract more of your soul tribe to work with you! Shine as powerfully on the inside as on the outside! Designs Embellish the Body and Enliven Your Spirit!